Bridget Drakeford has been designing and making pottery since 1977. During the early years in Scotland she made domestic stoneware, but now works exclusively in porcelain using both reduction and oxidised firings. She has been a prizewinner at the Mashiko Ceramics Competition in Japan, and at the World Ceramic Exposition in Korea. She won an Arts Council Award for an exhibition and study tour to Japan in 2005. 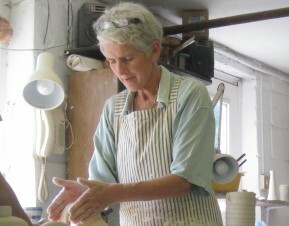 She is a professional member of the Craft Potters Association of Great Britain and has exhibited widely at major venues throughout Britain and Internationally. Bridget’s influences come principally from the classical forms of European and Oriental ceramics. These influences have come together in assured forms and technical concepts, to which she adds refined and individual touches. 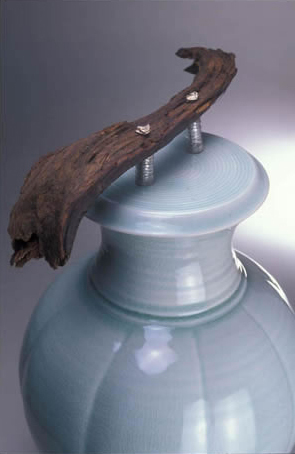 Her work ranges from wide, open bowls to teapots & caddies with some pieces having innovative decorative detailing in precious metals, hand worked by the artist. All of her pieces are graced with a subtlety of finish and sophisitcation of glaze colour that makes them very collectable & much sought after. As many returning students to Wobage will verify, Bridget has made regular appearances, demonstrating and teaching alongside Patia during her annual porcelain throwing courses, and in the 2012 programme during the Teapot course. We very much look forward to Bridget returning to the teaching programme at Wobage in future years.